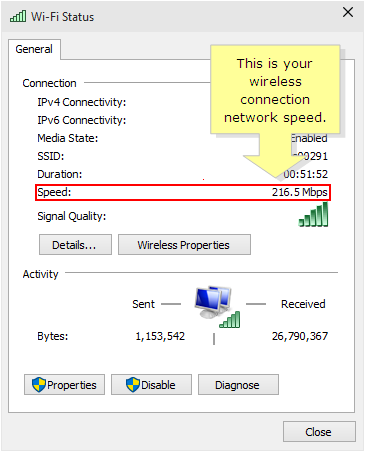 The wireless connection speed of your computer is different from the Internet speed from your service provider. 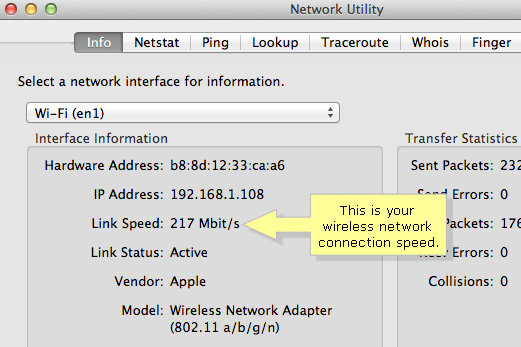 The former is the communication speed between your device's wireless adapter and your router. A good wireless router is important to get the desired speed you want on your network. However, there are many factors that can affect the wireless network connection speed between your router and computers. To know more about this, click here. NOTE: The wireless signal bars do not necessarily indicate your Internet connection speed. The signal bars represent the signal strength that your wireless computer is receiving from your Linksys wireless router. If you are using a Linksys Wi-Fi Router, you can also test the Internet connection speed using Linksys Connect. For instructions, click here. If you have a Linksys Smart Wi-Fi Router, click here. Right-click the wireless adapter icon located at the bottom-right of the Desktop screen, then click Open Network and Sharing Center. 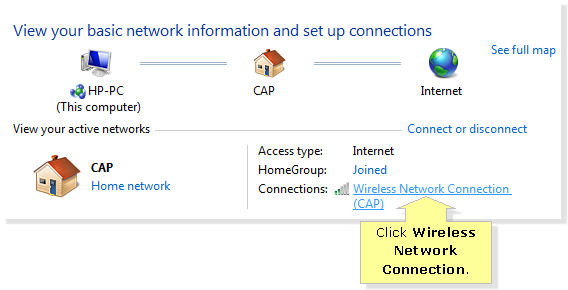 NOTE: If you are using a Windows 10 computer, the wireless adapter icon will look like this: . The Wi-Fi Status window will appear showing your computer’s wireless connection details. 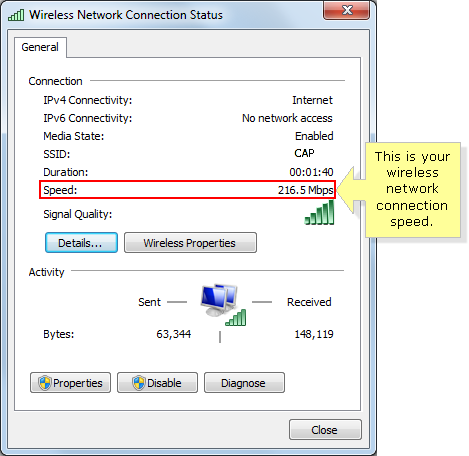 The Speed section indicates the connection speed between the wireless adapter and the router. Click on the Wireless icon on the bottom-right of your Desktop screen and select Open Network and Sharing Center. 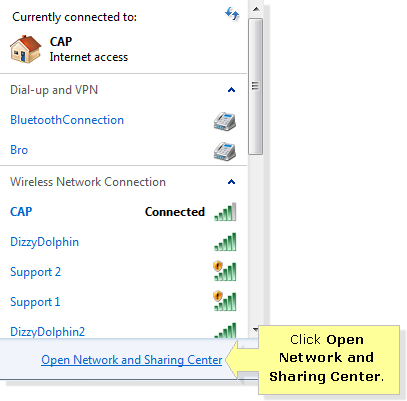 On the Network and Sharing Center window, click Wireless Network Connection. The Wireless Network Connection Status window will appear showing your computer’s wireless connection details. The Speed section indicates the connection speed between the wireless adapter and the router. Right-click on the Wireless icon at the bottom-right of your screen and select Status. Click on Spotlight then enter “network utility”. Select Info and choose Wi-Fi (en1) from the drop-down options. NOTE: The wireless connection speed will be displayed as the Link Speed. Hold down the Option key and click AirPort. Your current connection information will be displayed. 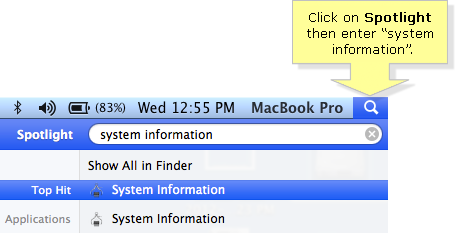 Click on Spotlight then enter “system information”. Select Network and choose Wi-Fi. Your current connection information will be displayed on the right. QUICK TIP: To improve the wireless connection speed between your router and computer, move the computer closer to the router or remove any physical obstructions and interferences between your wireless router and computer. This will help improve the signal your computer is getting from the router. For instructions, click here.